Discussion in 'Flower Gardening' started by Clay_22, Mar 20, 2012. First Plant Signs of Spring. Yup its spring time at your house. Daffs are such a happy flower. Well... guess it's official now! Springtime! No argument here, spring is upon us. Daffs always make a good spring flower. Yup. spring is THERE too! 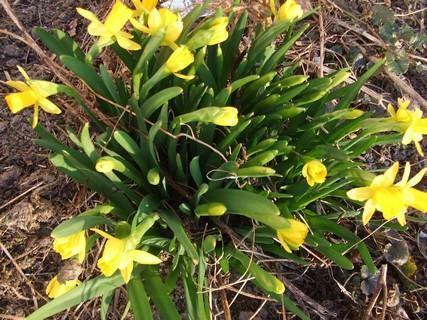 i love daffodils sure sign of spring...most of the neighborhood's are out and happy.....the ones in the front are already dancing in the breezes and the ones in the back are just opening up now..grape hyacinths & tulips are next, alliums are right behind!!!!! Yup like the others have said, Hip,hip, horray for spring and all the beautiful flowers that are just starting. I have a few differnt kinds of daffodils. My fav's the double ones. So far I only have 2 single daff's open. Those are beautiful. It is encouraging to read these favorable remarks about the arrival of Spring. If I had $20 for each daffodil bulb I have planted, how wealthy would I be? @Sherry8, What did you do with the daffodils you got rid of?